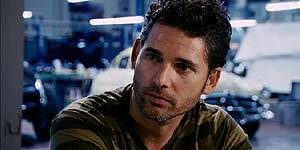 Engaging, unexpectedly personal documentary that takes an intriguing look at Eric Bana's lifelong obsession with his car but the film's tight focus means that it overlooks some potentially rewarding other elements. Directed by Eric Bana, Love the Beast is essentially a love letter to his beloved Ford Falcon muscle car that he's had since he was a teenager in suburban Melbourne. Bana explains that his family garage was like a clubhouse for him and his three best friends, Tony Ramunno, Jack Vukoja and Andrew Templeton, all of whom helped him rebuild the car during their formative years. It's a point of pride to Bana that, despite Hollywood fame and fortune, both his friends and his car have remained a constant in his life, to the point where they still get together and work on the car, even entering it in the 1996 Targa Tasmania five-day rally. However, when Bana decides to enter the rally again, his subsequent headline-grabbing crash prompts him to take a close look at his obsession, with helpful contributions from an unlikely trio of fellow car obsessives: Jeremy Clarkson, Jay Leno and Dr Phil McGraw. It might seem unusual to describe an obsession as sweet but Bana's feelings for his car are almost romantic in nature, though the film does a good job of showing how closely the car is tied in with his nostalgic family memories, his friendships and his sense of identity. The interviews are equally interesting (not least because you get to see Leno's frankly astonishing car collection) but they take on an added poignancy once you realise that they're being conducted post-crash and that Bana is seeking their advice on whether he should rebuild his now totally destroyed car. However, in focussing so tightly on Bana's obsession with the Beast, the film ignores several other interesting elements, such as the potential conflict with his day job or the fact that his friends don't seem to actually like each other and only ever get together when Bana is around. In addition, the film is surprisingly humourless, despite a promising opening that includes a car-based routine from Bana's early stand-up career. Petrolheads can probably go ahead and add an extra star but otherwise Love the Beast is a likeable and occasionally moving documentary, even if it's not quite the success it could have been.